This flexibility allows you to have a variety of storage spaces hooked up at once. The latest release from the folks over at Sybas technology is the Popcorn Hour C-300, a networked media player that gives you a great deal of functionality. It streams video and audio from anywhere on your network, but that's not where it ends. 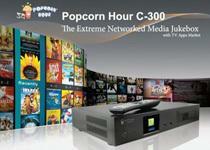 The Popcorn Hour C-300 seems to meet Blu-ray players halfway. As BD players are getting more streaming options, the C-300 is a media streamer that's adding more hardware options. Specifically, you can add a Blu-ray drive to the device, allowing you to stream, play back computer files and watch your Blu-rays without having to change the input on your TV. In addition to the Blu-ray player, you can attach a 3.5 hard drive or 2.5 inch SATA drive chock full of your favorite shows and movies. There's also app support for streaming shows and movies, but if you're looking for staples like Netflix you'll have to go somewhere else.